The Coordinate Geometry Editor now accepts Degrees/Minutes/Seconds in a spaced format. An issue that caused feature lines to not display as expected has been resolved. Volume tables now remain as saved when reopening the drawing. Non-orthogonal sample lines now sample corridor links as expected. Profiles are no longer duplicated in multiple alignments. An issue that caused pipes and pipe labels to not plot as expected has been resolved. Creating a reference to a grid surface no longer causes the application to close unexpectedly. Alignment labels using the crows foot block are now aligned as expected. The structure style block rotation is now aligned with the 3D solid. The Part Matchup Settings for Box to Box and Elliptical to Elliptical are no longer being ignored. 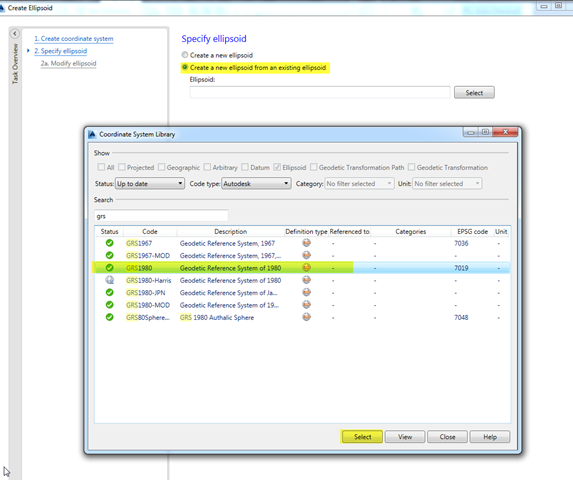 DwgRelPath retains leading periods on Windows XP based workstations. Station Equations now work as expected when the decreasing option is used. Waterdrop polylines now display proper linetype generation. New surfaces created from a DEM now use the user specified coordinate system. The stability of traverse analysis has been improved. The latitudes and departures for the face 2 observations are now calculated as expected. The accuracy of the traverse analysis report has been improved. An issue that caused incorrect survey backsight calculations has been resolved. An issue that prevented the use of the Crandall rule when adjusting with a mapcheck or a bearing traverse has been resolved. Accuracy when using a reciprocal observation field book file has been improved. Did you know when you take a picture on your iPhone or iPad with location turned on, it reports the latitude and longitude to the image file? I had a customer call me the other day and wondered if they could place images in Civil 3D at the exact point where they were taken. After getting with my co-worker, Jeff Juniewich, we came up with a solution. The customer was pleased. However, the customer called back the next day and wanted to know if the solution given to him could have an arrow pointing in the direction of where the image is referencing. Going back to Jeff, then beating our head’s against the wall, we got it figured out. Below is a video on how to accomplish this. Keep in mind, you probably won’t be able to get this to work correctly if you do not have or use Global Mapper. 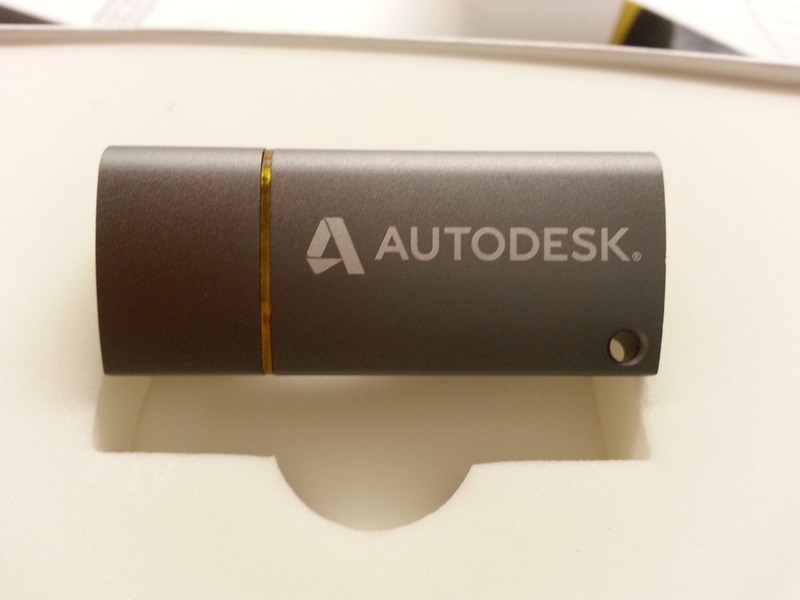 Transitions with a Sub Assembly – Autodesk Discussion Groups. 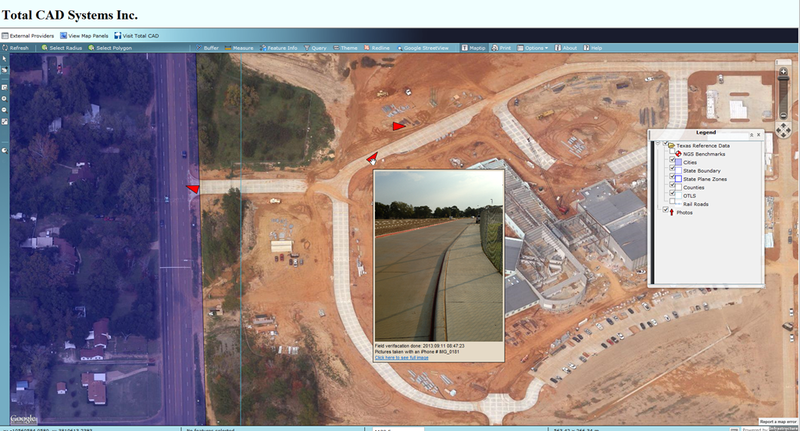 Have you ever wanted to add GIS data that is in GRID to your Civil project that is in Ground through FDO? Here is a two step procedure for creating a Ground Coordinate System. When creating a ground coordinate system for State Plane Zones that use the Lambert Conformal Conic projection there is no place to enter the scale factor. To get around this you must create a custom Ellipsoid. 1. 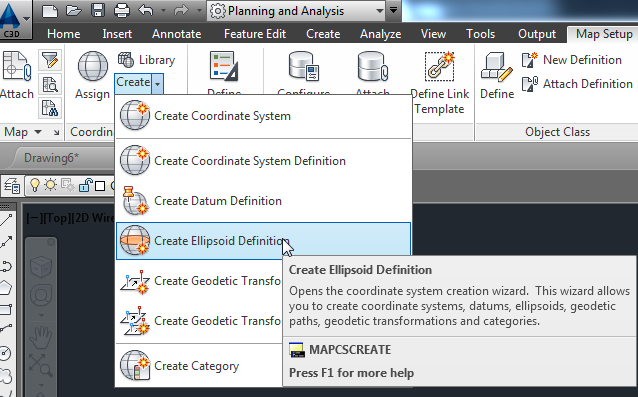 In the Map Setup Tab, from the Create dropdown select Create Ellipsoid Definition. 2. 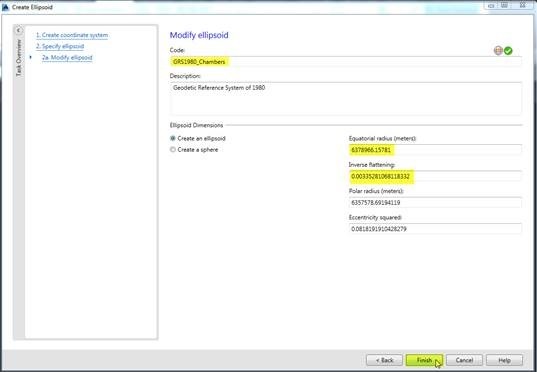 In the Create Ellipsoid window select Create a new ellipsoid from and existing one. 3. Select GRS1980 from the list. In the Create Ellipsoid window hit Next. 4. 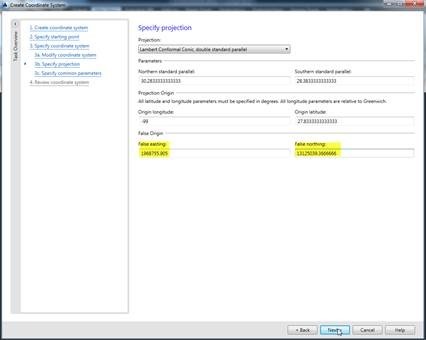 In the Modify ellipsoid window, Modify Code: by appending the County Name (or project name). 5. 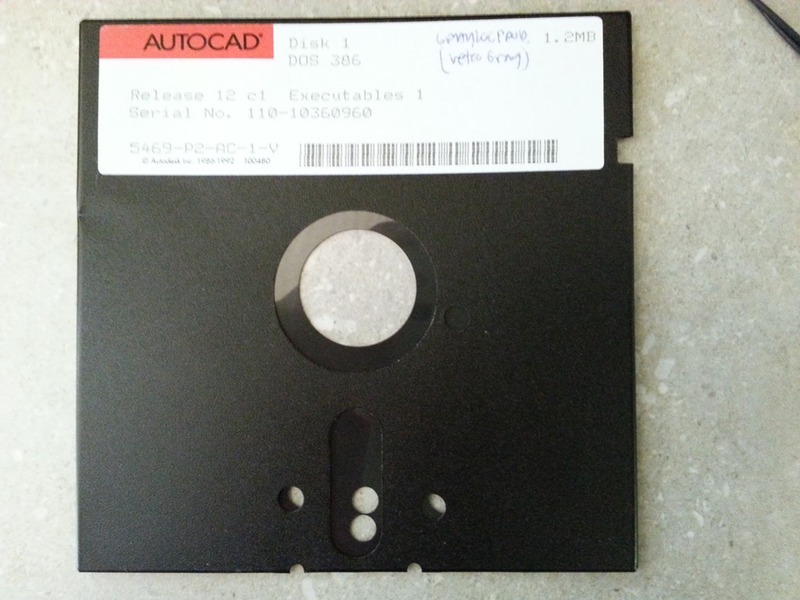 Copy and paste the value from the Inverse flattening to Notepad. 7. Paste the result back to the Equatorial radius (meter). Notice the Inverse flattening changed. 8. Now copy the original value for the Inverse flattening from notepad and overwrite the change. 9. It should look like the image below. Pick Finish. 3. 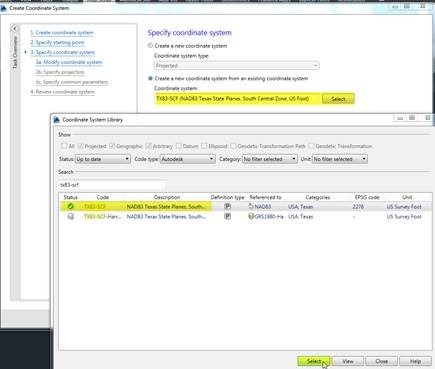 In the Specify coordinate system window select the radio button for Create a new coordinate system from an existing coordinate system and pick the Select button. 4. 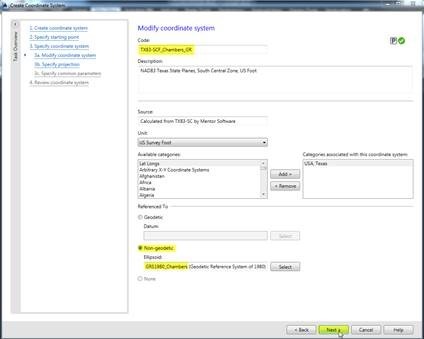 Select TX83-SCF by typing in the search bar and pick the Select button. 6. Give the Code: a modified Name (TX83-SCF_Chambers_GR). Modify the Description if you like. 7. 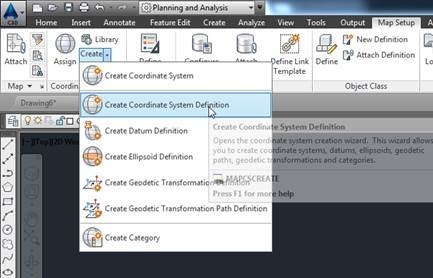 In the Modify coordinate system window pick the radio button for Non-geodetic and pick the Select button to choose the new Ellipsoid you created by picking on the Status dropdown and selecting User Defined. This is your new Ellipsoid with the scale factor applied. Select Next. 8. Multiply the False eastings and False northings by the scale factor and replace them in the window and select next. 10. Select Finish on the last page to complete the new ground coordinate system.